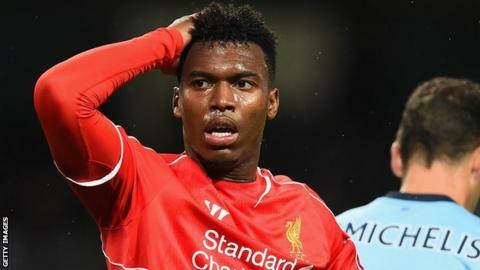 Liverpool and England striker Daniel Sturridge could be sidelined for six more weeks with a new thigh injury. Sturridge injured his thigh in training on Tuesday and scans show a different problem to his previous complaints. The 25-year-old, who scored 25 times last season, has played just three Premier League games this term and only returned to full training last week. He suffered a thigh strain while with England in September before picking up a calf strain in training in October. Liverpool have won only four times in 14 matches without the former Chelsea and Manchester City forward and are in 11th place. Brendan Rodgers's side have scored just 14 league goals this season, with strikers Mario Balotelli, Fabio Borini and Rickie Lambert failing to find the net. Rodgers criticised England's handling of Sturridge after he was originally ruled out for up to three weeks. Balotelli picked up a hamstring injury on international duty with Italy and may be a doubt for Liverpool's next game against Crystal Palace on Sunday.